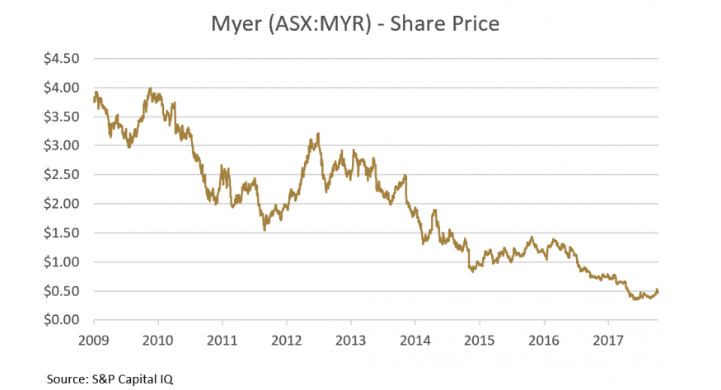 I’m not alone in wondering how long Myer (ASX:MYR) is going to be around. Sales have been trending down for some time now. The share price is going in the same direction. Myer has $2.7 billion in lease commitments thanks to its previous private equity owners. A shrinking business with high fixed costs sounds dangerous. If Myer is going to survive, things need to change. The company’s ability to compete – indeed any department store’s ability to compete – is in offering a unique customer experience. Sephora is a great example of a full-service retail store. Stores are always well-staffed with professionals who are genuinely passionate about cosmetics. Sales staff can tell you about products from various different brands and recommend something specific to you, according to your skin type and concerns. Myer has been doing the opposite. Cutting costs and reducing staff and thinking that sales will hold up. My past experiences at Myer involved walking into a giant multi-level store and trying to find my way to the product I was looking for. It usually involved minimal human interaction. Most people I have spoken to have had similar experiences. That’s why I was very interested to hear from Robbie Tutt, the General Manager of Omni Channel at Myer, when I attended the Online Retailer conference in Sydney late last month. He was quick to admit that the current Myer experience is simply not good enough. When asked how Myer plans to compete with Amazon, Robbie responded that they would survive by sticking to their core and improving customer service in-store. “Myer has 63 stores. Something that Amazon doesn’t have”. On my way back to the office after the conference I ducked into Myer on Pitt Street to see whether there was any change to back up the rhetoric. I wandered straight up to the womenswear section where I noticed a senior manager standing in a huddle with a number of sales staff. They were discussing product placement and how to best interact with customers. Every time I turned around, there was an employee offering to assist. At one point I had a sales assistant hand-selecting items and offering advice on different styles, sizing and fit. She then walked me to the counter and put the sale through herself. It felt almost like a personal shopper experience. There might be some recency bias at play here but it certainly didn’t feel like the other times I shopped at Myer. I walked out with a new jacket. My first Myer purchase in a couple of years. It seems Myer is acknowledging the issues with their current model. Anecdotal evidence suggests that the company is actively trying to improve the customer experience. It’s not that simple though. Myer gained popularity in a time when department stores were smaller, and trained staff were able to assist across multiple brands and product lines. In the big box stores we see today this kind of service might not be possible. I’m not convinced at this stage. We won’t be buying the stock in a hurry but my recent store experience has given me a little bit of hope. Has anyone else noticed a change in the customer service experience at Myer? Will be looking out for a change of attitude on the floor at Myer... Aus economy hasn't had a recession for so long there hasn't been an incentive to up their game. Also, read the LW post 'Winter is Coming' although, as you say, the PE crowd saddled them with lease burden. One valuable customer group are the time pressed. MYR have a great resource for going in and buying a corporate wardrobe or similar, where the customer wants to do a lot in a short time and is happy to put a lump sum on a platinum card and walk straight to their car (or hail a taxi/uber) and get on with their life. This is my experience when shopping with 'The Boss' and acting as a mobile clothes horse! I won't be surprised if they move to leverage a phone app that leads customers to what they're looking for and links with stock levels to confirm the item is available. Westfield centres have decent examples of directories and guides. And good to see fresh faces at Forager! My experience is normally standing around, in a queue at the register wondering if anyone is going to show up to process the purchase and then just giving up after 5-10 minutes of trying to get someone to pay attention and help out. My previous observations were stock levels along with service on a continuous downward spiral. To my surprise I visited again in July and was surprised to be served almost immediately and they had the exact clothing I needed in my size... perhaps signs of a turnaround? I subsequently bought some shares at 0.35c and bailed out at 0.45c - thought I would quit while I was ahead.